A popular traditional yoghurt based drink from India available in two versions, salted (savoury) and sweet and usually served cold. It’s made from good quality thick, creamy and sour homemade yoghurt. The yoghurt is diluted with water and flavoured with sweet or savoury ingredients The mixture is whisked until frothy and served cold or with ice cubes. 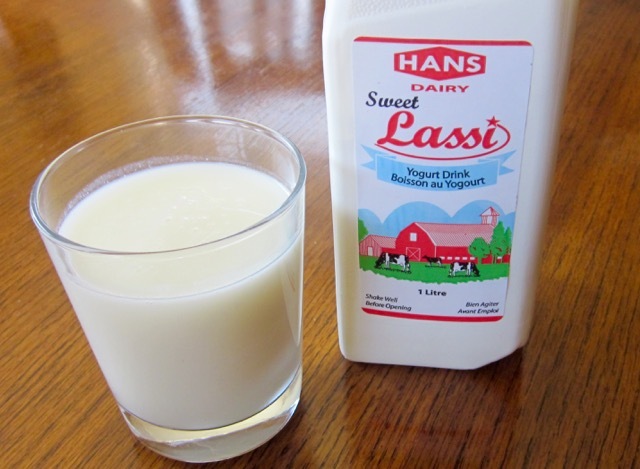 Lassi is popular as a street food but can also be homemade or store-bought. Sweet Lassi, also known as metha lassi is sweetened with sugar, honey or fruits and ingredients like rosewater, lemon or lime may be added. For example, mango lassi is made from yoghurt, water and mango pulp with or without added sugar. Salted lassi often contains spices such as roasted cumin seeds, ginger, coriander leaves, garlic or black pepper. The spices may be added on their own or ground into paste. The popular ingredients in the paste are usually green chilli, ginger, coriander leaves and garlic. I love a good mango lassi. We get t at the farmer’s market sometimes. At least you have a diverse farmers market. Ours is so small. Enjoy the week! Yum, Mango lassi is a favorite of mine:)! My son loves it. He can finish the whole thing in seconds. Have a great week! Thank you Liz. Alphonso mango and the Junaghad Kesar variety of mangoes are my favorite to make this lassi, though I do not get the Kesar variety here, but Alphonso is seen here in the markets when in season. We don’t get any good tasting mango here. What a shame!!! Enjoy the new week!